Opera Divas are always celebrated and praised for their beautiful voices and performances on/off stages through out the World. I'm not a fan of Opera at all, but those sopranos and mezzo-sopranos, really moves me, I don't know why. Tried for more than twenty years, to find the reason for this strange attraction, and no clue by now. It all started at my JazzGuru, Mr.Bob Barroso, house in 1992, when at some point into that always wonderful jazz nights, he did put the recent André Previn's Jazz CD with a singer we all should guess who it was. Half through the CD and I had no clue of who the singer was, but at that point Bob showed me the cover album....I could not believe that the sweet and poweful voice I was delighted with, was the Grand-Diva Kiri Te Kanawa. From Mozart, Puccini and Verdi to Arlen, Mercer, Van Hausen, Mandel, Rodgers and Hart.....has the world gone crazy, I did recall back then. Her singing at "It Could Happen To You" was just breathtaking. When the record finished I was just amazed. I thought to myself: this is a once in a lifetime thing. Two years later, André Previn must have loved Kiri's album too, because as I was looking for some new releases I saw this CD with Diva Sylvia McNair having a great time, and she really did. A great album again with Previn on piano (always great playing) and bassist David Finck. Oh my God ! Lighting did strike twice, what a great CD...you should hear Sylvia singing "Remind Me" (Peggy Lee's rec.also great). I was truly satisfied with both great cd's, mixing the jazz world with opera divas has been great. 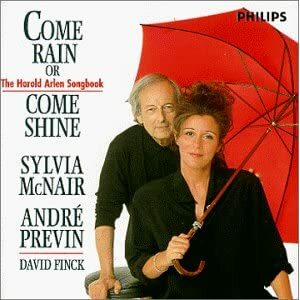 1996 saw a new Previn/McNair/Finck cd, again just as good as their last one, but with H.Arlen songbook. Also in'96 another Diva, Dawn Upshaw, came with a Rodgers/Hart cd with Fred Hersch on piano, and in the song "Why Can't I ?" with his Trio, just great. These were great time for JAZZ ! Enough of Sopranos, in 2001, Mezzo Anne-Sofie Von Otter came with a release with Elvis Costello and a swedish group jazzin' through 18 songs: Bacharach,Beatles,Tom Waits, Costello and ABBA's Benny Andersson. Recorded on HDCD-encoded, this a favorite of mine. A great surprise ! Then my heart almost stopped, it was 2005, a new Diva/Jazz album was released, Amercan soprano-Diva Renée Fleming was giving her shot in Jazz. Well nothing new there, Fred Hersch was up again now with guitarist Bill Frisell. Not my guitar pick, but okay, let's start..........well........she started with one of my all-time best song "Haunted Heart"! This is just eargasm !!! Fred's Steinway-piano and Renée's dark, down-bottom voice was just amazing! EARGASM ! MUST HEAR ! Now Brad Mehldau has recorded with both: Von Otter and Fleming, recording opera-like songs and jazz arrangements. Just great ! Well these are my thoughts on this strange musical mix, great voice and great playing couldn't go wrong. At least on these cases. This is what music is all about, JAZZ is all about freedom, and playing whatever you feel like, not knowing what the results are going to be. Go on and hear it !!! Enjoy and Eargasm for all !!!!! THIS IS THE PREVIN/HERSCH/MEHLDAU PROJECT ! Ellis Marsalis,Jr. - A True Jazz Musician !